Gravity's setting is in space, around space shuttles and space stations and the Hubble telescope and the like. Gravity's arc is a fallible human struggling to survive against overwhelming odds. The fallible human is played by Sandra Bullock, who benefits from being one of the most-liked actors in America, and from being a veteran of movies if not of space--meaning she knows how to convey inner turmoil without chewing the scenery. I wouldn't be surprised if she won an Oscar for this role. On the other hand, the film is a funny experience for people like me who are kind of technical--it's as full of "naw that couldn't really happen"' elements as Star Wars, yet at any given moment it LOOKS so doggone realistic...Most of the bits from which the film is constructed are pretty believable; just not how they're strung together. Scientists have been slamming all the errors in the film--and then saying how much they loved it. It's that kind of movie. Like a dog you have that keeps chewing your shoes up but is so adorable you forgive it. And it's certainly a white-knuckle thrill ride that keeps 'em coming through the whole film. Anyone who admires Sandra Bullock and/or George Clooney should see it; anyone who's a space/NASA fan should see it--BUT you really, really, really have to treat it as romantic fable with great-looking hardware trimmings, and give your sense of disbelief the night off before you walk into the theater. It's also a must-see for those who're interested in what the state of the art is with CGI. For all that I found it moving. Even though what happens could never happen in reality, it is emotionally honest. I usually don't like films that are full of technical wowsers, but I forgave Gravity its debits because of its merits. 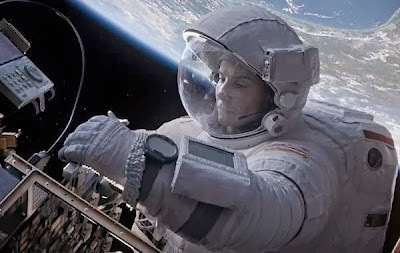 And the first three or four minutes of the film, with no music in the soundtrack, just showing us Bullock's character on a spacewalk trying to fix a thorny hardware/software problem, might have been my favorite scene in the movie. But then I'm a space buff. I saw it with a hardboiled software engineer from India who loathed it (he likes art films), a Russian art therapist with a BS in mathematics who kinda liked it, and my accounting manager wife who loves sci fi gave it a B-, calling it The Perils of Pauline in modern garb. I notice on Rottentomatoes.com it got super high ratings by both critics and viewers, though most critics know less about space than I do, so in this case I have to take their fulsome praise with a grain of salt. I bet when Sandra Bullock read the script she said YES! instantly. What a showcase for her talents. She absolutely carries the movie. It's hers. My wife was annoyed by one scene where we see her peel off her spacesuit, winding up in her skivvies--reminding me of Barbarella's eponymous character's zero-G strip decades ago (and I'm sure the director was thinking of that). Very few 49 year olds look as good as she does. I realize it's part of her profession to look good--personal trainer, personal dietician etc. no doubt--but it still takes dedication to look like that. But appreciate it while you can, since she's in a space suit through most of the film. One side note--my favorite Star Trek episodes happened entirely in space (and not on that wretched cheaty Holodeck), and this film's spacious (so to speak) setting is also lovely. It's a joy just to watch what's on the screen. And, like so few other space films, things don't whoosh! as they zip by you. The only other space films that obey this simple fact are 2001, Apollo 13, and Serenity, as best I can recall.